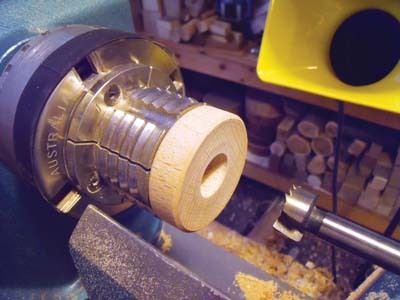 Eleven years ago, I bought a Vicmarc scroll chuck and also a set of shark jaws. I found these jaws so versatile that I use them for a high percentage of my turning. But as with many projects undertaken, one set of jaws does not do everything. 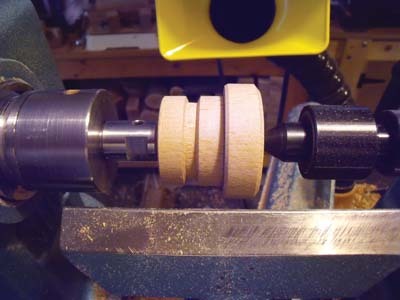 I needed to grip various diameters of cylinders so set about making different sized wooden collets going from 12mm (1/2in) up to 28mm (1 1/2in) in 3mm (1/8in) increments. These collets were made to fit inside the shark jaws. 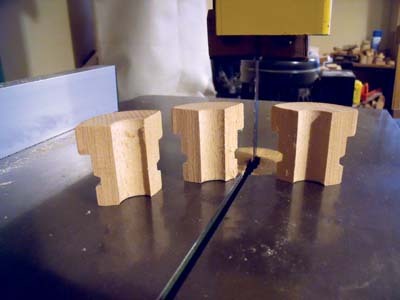 After much trial and error, I found that they worked better for me when sawn into three sections rather than the normal four sections found on chuck jaws. I also found a simple and inexpensive device to hold them together - an elastic band. 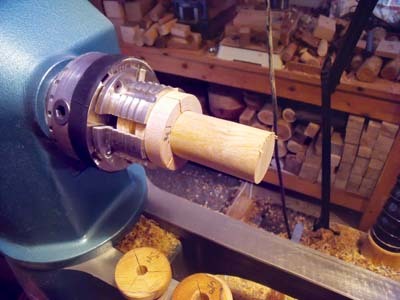 Of course the design can be modified to suit any make of extended chuck jaws and I hope you find them helpful with your turning. 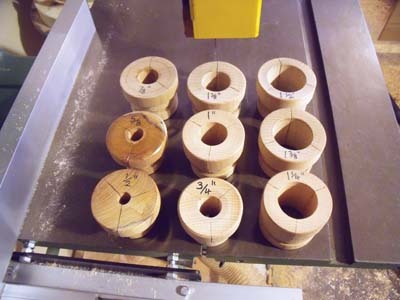 The requirement for turning is a blank of any suitable close-grained hardwood, the dimensions for my jaws being 50 x 50mm (2 x 2in) and 40mm (1 5/8in) in length, but adjust this as necessary to suit your jaws. Mark the centre on each end of the wood and mount it between centres. 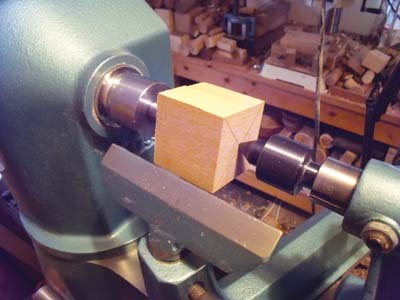 Turn it down to a cylinder with a spindle roughing gouge, and then square off each end using the long point of a skew chisel. Repeat the procedure changing the cut hole size to create as many different sizes as you require. There are extended jaws available for other makes of chuck, which would also be suitable. Two that I know of are the O'Donnell jaws, and the Nova spigot or long-nosed jaws. 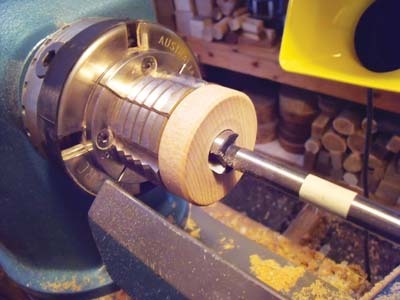 You can see a cylinder of wood held perfectly in the 35mm (1 3/8in) collet set. It is important to match the diameter of work to be held to the collet size or you will not have a secure hold. I hope this helps you to make your own. The collets are very handy indeed and don't take a lot of time or money to make. UK turner Colin began woodturning back in 1975. He is an active member of the AWGB (Association of Woodturners of Great Britain), and also the Tudor Rose Woodturners. In his spare time, Colin also makes violins and flutes, and occasionally gives woodturning tuition. He very much enjoys helping other turners to overcome their difficulties.